It is said that long time ago there were only nine families in Jiufen (Jioufen). Before the roads on land were built, all materials were transported via ships. Thus a habit was formed that nine pieces of same object were purchased at one time for reservation. Hence, the place was called Jiufen (Jioufen) used to the center of gold mining. It is located within the hills in northeast of Taiwan. The village is next to the mountain and facing the sea. In 1890, someone struck gold near Jiufen (Jioufen). The poor village with only nine families soon attracted prospectors of 4,000 families. The village once was gold city of Asia and called little Shanghai or little Hong Kong. However, with the decline of gold mining activities, Jiufen (Jioufen) fades. Later, several movies chose to shoot here and the movies won international acknowledgement. For example, the film the Sad City has won first prize in Venice Film Festival and awakened people's memory of Jiufen (Jioufen). It seems that the prosperous old streets, buildings, mines and the glamorous gold digging days are flashing before our eyes. The place is whispering its golden past. Now, there are many unique teahouses in Jiufen (Jioufen). These teahouses are best stops during visit to this mountain village. Also, there is the beautiful ocean view of Keelung outer sea. The most prosperous shopping district is Jiufen (Jioufen) Old Street. It goes through most of the village. There are many visitors on the street. Along the street there are shops vending the most famous country snack of Jiufen (Jioufen), yam dish and various local dishes. There are some historical items well reserved. The trip to Jiufen (Jioufen) is full of fun and delights. Jiufen (Jioufen) has many accommodation places provided by local residents. If you were not in a hurry, you may want to pick a nice inn and stay for the starlight and fishing lights at night. Shifen Special Scenic Area is located in Shifenliao between Shiding, Ruifang and Shuangxi in northeastern Taiwan. Administratively part of Pingxi District, New Taipei City, the terrain here has been carved by a tributary of the Keelung River, northern Taiwan's largest and longest river, into a ravine with a dissected topography. The faults and rock formations have given birth to numerous waterfalls along the river extending north from Houtong to Sandiaoling and onwards to Shifenliao and Pingxi. Among the biggest and best known of these falls, and a popular visitor attraction, is Shifen Waterfall. Shifen Waterfall lies between Dahua Station and Shifen Station on the Pingxi Railway Line in Pingxi District, New Taipei City. Torrents of water thunder down this curtain-type fall like a white satin sheet. As the water plunges into the large, deep pool beneath, it raises mists that often enshroud the falls. On sunny days, the mists paint dazzling rainbows in the blue skies: a sight that has earned the waterfall pool the nickname of "Rainbow Pond." Because its bedrock slopes in the opposite direction of the water flow, Shifen Waterfall is a cascade-type waterfall similar to North America's Niagara Falls, earning it the nickname of "Taiwan's Niagara Falls." This new 24-hectare facility is located beside beautiful Dong Mountain (Dongshan) River in Yilan. In addition to organized displays and performances of culture and art, it also provides a stage where performing artists can show off their creative works. The emphasis here is on the continuous propagation, innovation, and renewal of traditional arts. You can stroll casually among artistic creations, listen to elegant music, and enjoy exciting opera performances--and you can even participate in the process of artistic creation yourself. From the Center, you can take a boat and visit the Dong Mountain (Dongshan) River Water Park. The Jimmy Square used to be an old railway staff dormitory; it was later transformed into the transit center of long-haul buses. As Yilan happens to be the hometown of the famous illustrator, with the theme of "in memory of the transient scenery", he created the first square in Taiwan featuring his own illustrations, in Yilan. The square still maintains the original historic buildings and old trees. Here, you will see the male and female main characters from Turn Left, Turn Right (A Chance of Sunshine) departing hastily in opposite directions. Or you can see the little boy and girl from The Starry Starry Night waiting together for the bus that will never come. Or you can see the suitcase that holds the traveler's memories from Sound of Colors. All the pieces of the installation art displayed at the Jimmy Square create limitless room for imagination and touch people's hearts. The Dong Mountain (Dongshan) River is only 24 kilometers long, but it is the fifth-longest stream in Yilan. A multi-purpose riverside recreation area has been planned along its course to provide for sports, leisure, and recreation activities divided into upstream, midstream, and downstream sections, each of which exhibits a different recreational character into what, it is hoped, will make the river into an outdoor water park. The most important recreational site on the river is the Dong Mountain (Dongshan) River Water Park, which has been designed to rebuild the natural relationship between man and water. This park simulates the natural landscapes and incorporates elements of the native culture of Lanyang-for example, there is a water stage, five conical stone towers built of pebbles, and Turtle Island, which rises from the sea off the Yilan coast, bring the landmark of Lanyang into the park, seemingly without thought. The banks of the Dong Mountain (Dongshan) River are claimed by legend to be protected by a green dragon and a yellow dragon, and for this reason undulations and curves are built of pebbles along the river's banks to simulate dragons' scales, with pottery tile inlays of green and blue, and orange and yellow, adding to the characters of the two different types of dragon. Interesting mosaic pictures--masterpieces executed by the children of Lanyang-embellish the dragon-skin steps. The Lin Mei Shi Pan Trail is a forest trail planned by the Forestry Bureau, and was opened to the public in 2005. The trail is approximately 1.7 kilometers long in a circular path, and takes approximately 80 - 120 minutes to hike. A great place to relax and de-stress, the gentle slope of this wide forest trail is suitable for visitors of all ages. If you look closely, you can also see low-altitude forest life, "quadrangular sandstone" rock formations as well as an abundance of natural resources. Oftentimes, you'll get glimpses of animals that journey through the forest with you, be it frogs, butterflies, or even monkeys. Take in the phytoncides of the fresh forest air on a hike with the family! The Wufengqi Falls are one of the eight great scenic spots of the Lanyang Plains, belonging to Jiao River (Jioxi) Township in Yilan County. The Wufengqi Falls are named for the five sharp peaks which stand in a row behind the falls, that look like the five triangular banners that usually hang down the back of the war generals costume in Chinese Opera. Fog and mist drift gracefully around the mountaintop year-long, and torrents of mountain springs continuously flow down its slopes, forming the three layers of cascades that are now the Wufengqi Falls. There are three layers to the Falls, and they measure 100 meters from top to bottom. The entrance to the scenic viewpoint is situated near the bottom layer of the Falls, and there is also a barbecue area, and a play area for children to splash in the pools. A viewing pavilion is constructed at the mid-layer of the Falls; there is a vast expanse of vision at this point, and tourists may enjoy viewing the lush mountains, and the cascades shooting out from the precipices. The scene in the eight famous scenic views of Lanyang that is poetically named, mists draping the western peaks refers to the Wufengqi Falls. The Falls are situated in an enclosed valley, which enhances the mystic beauty of the peaks. At dawn, as the sky slowly begins to brighten, musical birdsong can be heard resonating throughout the valley; the unique tranquility in the atmosphere is indescribable. To create and promote the new image of the warm spring, the Yilan County Government had planned to establish the Tang-wei-gou Park, through four phases of construction, in an attempt to provide its visitors a soothing spa in a natural setting. The park was inaugurated on December 17th in the year of 2005. The park features elaborately designed green landscape with viewing pavilion, outdoor foot spa, and old-fashioned juniper spa. Local residents come here to recall their memories of the traditional spa, while visitors from outside of the town enjoy the natural juniper spa. This memorial hall is home to several classical Chinese buildings, including the stately memorial itself as well as the National Concert Hall and National Theater. Another highlight is the hourly honor guard display. Chiang Kai-shek Memorial Hall is located in the heart of Taipei City. The area is 250,000 square meters and it is the attraction most visited by foreign tourists. Outside the gate of Chiang Kai-shek Memorial Hall, there are poles carrying the sign of true rightness. The architecture of Chiang Kai-shek Memorial Hall is inspired by Tientam in Beijing. The four sides of the structure are similar to those of the pyramids in Egypt. The material is white marble. The roofs are decorated with deep-blue glass as part of the reflection of blue sky and bright sun. It adds a touch of grandeur. The garden is planted with red flowers. As a whole, the colors of blue, white and red express the National Flag and the spirit of freedom, equality and brotherhood. The name of Ximending came from the period of Japanese colonization. At that time most local residents live within Taipei City. Ximending is the center for recreation. In 1896, the first theater "Tokyo Stand" was set up. In 1922, the place was officially called Ximending. In early years, the main business activity in Ximending was going to cinema theater. At that time, most cinema theaters are on E'mei Street, Chengdu Road and Xining S. Road. They were the center of Ximending's development. After the central government of R.O.C. was reinstated in Taiwan in 1949, a large sum of capital was poured into Ximending. Other than cinema theaters, there were department stores and other entertainment attractions. After the completion of Zhonghua Business Buildings, Ximending became the largest business and entertainment center in the country. In 1990s, the business and entertainment activities of Taipei gradually shifted to East District. Later, Zhonghua Business Buildings were torn down for road construction. Ximending became silent for a while. Then, MRT Bannan Line was completed. Zhonghua Road was converted to be a prosperous main street under the planning of Taipei City Government. Furthermore, there are many emerging squares and activity locations. On holidays and at weekends, people gather here for art, culture events or sports, music performance. The business opportunities and people are coming back to Ximending. Beipu district is mostly located on mountainside. It is divided into the Beipu and Nanpu basins by the river. Though there is no broad and flat alluvial plain in the country, soil is a fertile and the water sources for irrigation are rich. Beipu is one of the last-developed places in the county, and it was called Jhubei-bao Nanhsing Chuang. Due to its specific armed immigrant background and the Hakka influence, it became quite a different settlement. Beipu accumulated rich historical heritage, and local cultural groups are very active, it is a dynamic preservation area of dayi Hakkanese culture, and a creative and energetic Hakka culture circle. Well-known globally for its wood sculpture, Sanyi Township is situated at the southernmost of Miaoli County. Every year from November to March, the township is regularly affected by mist day and night. At this period, the township is mystically covered in low flying white fog that resembles a Heavenly Paradise. Hence, it is also regarded as the Misty City of Taiwan. The Rainbow Village is a street art in Nantun District, Taichung, Taiwan. It was created by former soldier, Huang Yung-Fu, who was born in Taishan county, Guangdong province in 1924. The eldest of four brothers and two sisters Huang's artistic talents were revealed early on. He began painting houses in his settlement, now known as Rainbow village, to save them from demolition. Over the years his colourful artwork, which includes birds, animals and people, has spread over the remaining houses in the village, which once contained 1,200 homes. The Fengjia Night Market is one of Taichung's famous commercial business districts, covering approximately one kilometer in diameter around Feng Chia University and includes the Fengjia-Wenhua Night Market, Fengjia Rd., and Fuxing Rd. In this CBD, you can find delicious snack foods, quality clothes at reasonable prices to express your unique personality, and the trendiest mobile phones at excellent bargain prices. After the Department of Transportation made great efforts to tackle the parking problems, it has become much easier to park your car or motorcycle at the Fengjia Night Market. Now you can enjoy a relaxing visit here without worrying about not finding a parking space. Sanxia (Sansia) is a traditional district located in northern Taiwan, easily accessible from Taipei. It has become known in recent years mainly because of its Qingshui Zushi (Divine Ancestor) Temple, which is unique among all the Chinese temples of the world for the painstaking and time-consuming dedication to classical temple arts that is manifested in its modern reconstruction work. The town, originally named Sanjiaoyong after its location at the confluence of three rivers, was given its present name of Sanxia (Sansia) (Three Gorges, also the name of its main river) in 1920. Nestled where fertile plains meet mountain foothills, and blessed with convenient inland river transport, Sanxia (Sansia) offered excellent conditions for development in the early years of Taiwan's settlement by the Chinese. It quickly became an important goods distribution center and a base for the production of camphor, the growing of tea, and especially the dyeing of cloth. As transport shifted elsewhere and the use of river transportation declined, however, Sanxia (Sansia) gradually lost its importance as a commercial center. Even as the town lost its economic importance, though, its cultural value remained undiminished, mainly because of Qingshui Zushi Temple. With its unparalleled combination of religion and art, this temple is the epitome of exquisite carving and complex structure as well as dynamic center of Chinese religious worship. 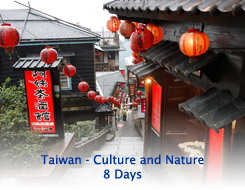 These features have also made it a powerful attraction for tourists from all over Taiwan and the world. Yingge is a pottery town, known as the "Jingde Township of Taiwan." The town has several hundred pottery plants, and equal numbers of pottery shops that sell their products. Jianshanpu Road is the origin of the local ceramics industry, and even today it has an old square coal-fired kiln chimney that serves as its landmark. Every October the town holds the Yingge Ceramics Festival; and, if you want to learn about the development of ceramics in Taiwan, the place to go is the Yingge Ceramics Museum. Yingge was called Geshi in the past, because there was a bird-shaped stone near the town. After World War II, the government named this place. The so-called Ge Old Street is Jianshanpu Rd. After reconstruction, the old street has become a modern street, along which are pottery and porcelain shops. Though the old street no longer has its antique looks, some ancient buildings can still be found in Yingge Town. The new street is paved with beautiful rocks. Visitors can not only appreciate the pottery and porcelain works, but they can also enjoy the street performance and coffee on the street. There are over 100 stores on the street. The products were pretty much the same in the past, but now the shops have their own workshops and artists. Each shop has its own characteristics and the pottery works are exquisite and refined. Some of the restaurants will give diners the cups or plates they use for free. Even the ice cream stand has lovely mugs and cups for customers to choose from. Besides purchasing the pottery and porcelain products, you can even learn how to make your own pottery works. Taipei 101 is the tallest building in the world, with a mass of shops on the lower floors, incorporating many top brands under the LVMH group, such as Louis Vuitton, Dior, Celine, etc. The fourth floor houses the Page One bookstore from Singapore, with the highest-roofed coffee house in Taipei and many fine restaurants. The National Palace Museum boasts the world's largest and most impressive collection of Chinese art and artifacts, dating back more than 7,000 years. The full collection comprises over 650,000 items, including calligraphy, paintings, jade, bronze, silk and curio pieces.